Beach seines consist of a long net operated from shorelines by hand. The net is weighted at the bottom and has floats at the top. Fishers use the beach seine to encircle fish which are then brought onto shore. Since schooling or spawning fish are easily targeted by beach seines, the use of beach seines must be well-regulated in order to be used in a sustainable manner. Bottom longlines are structurally similar to pelagic longlines with a central fishing line strung with hundreds of lines of baited hooks, except they are weighed down to fish close to the ocean floor. By using specific hooks and sinking the lines deeper, the amount of bycatch can be significantly reduced. A bottom trawl consists of a large, weighted net dragged behind a moving fishing vessel. This is a generally unselective method of fishing and can cause large amounts of bycatch. When used over certain types of bottom habitat, the trawls can cause the destruction of physical structures such as corals and sea sponges, and cause the injury or mortality of organisms. Impacts of bottom trawls can be minimized by modifying the nets and implementing management measures that limit designated areas that can be trawled. Casitas mean “little house”. They are a passive fishing technique and consist of constructed structures set on the ocean floor. Lobsters are drawn to the casitas where they seek shelter. They are free to come and go from the casitas and fishers will dive down to harvest lobsters from casitas. Cast nets are small nets weighted at the edges. The cast net is thrown into the water from shore, and the weights cause the net to sink around a school of fish. The fish are then hauled in. Divers use SCUBA gear to hand harvest species found on the ocean floor. They typically target species such as sea urchins and scallops. Diver-caught seafood is a selective way of fishing because divers visually identify the target seafood before harvesting, so bycatch levels are negligible. Divers do not typically cause habitat damage. Dredges, consisting of large metal baskets, are dragged over the ocean floor behind a moving vessel. Large metal teeth dig into the ocean floor to lift up clams or shellfish buried in the sand which can cause significant habitat damage and bycatch. Limiting the area in which dredges are used and targeting sandy, rather than hard bottoms can help to minimize their impact. Gillnets are walls of netting suspended in the water column. Gillnets are invisible to the fish who attempt to pass through and become entangled by their gills. Gillnets are generally a selective way of fishing when used in salmon fisheries, but can cause bycatch when used to target warmwater species such as blue swimmer crabs. Greenstick gear was developed as a fishing technique that would reduce the high bycatch levels of tuna fisheries. With this fishing method, a moving vessel is equipped with a vertical pole (the “greenstick”) from which a main fishing line is deployed and kept straight using a float at its end. Up to 10 artificial lures are attached to the main line with individual lines and skip across the water in order to attract tunas. When a tuna is hooked, the individual line detaches from the main line and can be reeled in. Like greenstick gear, buoy gear was also developed to reduce bycatch levels. This fishing gear targets swordfish. Buoy gear consists of several buoys from which one to two baited hooks are attached. Each buoy is equipped with a light, and the buoys are connected with a main line in a straight configuration. The gear is deployed at dusk. When a swordfish is hooked, it drags the buoy out of line which is visibly detected using the lights, and can be reeled in. Harpoons target one individual at a time, making it a highly selective way of fishing. Fishermen identify the species of fish and size before harpooning it. Jigs are a fishing technique normally used to catch squid. Fishing vessels illuminate the water which attracts the squid or fish, and baited hooks are mechanically jerked in the water to simulate the movement of prey. Jigging is a sustainable fishing method as it does not damage the habitat, and causes very little bycatch. Mid-water trawls operate in a similar way to bottom trawls, except they are dragged through the middle of the water column, and are not weighed down to drag over the ocean floor. This minimizes habitat damage. Mid-water trawls still have the potential to cause high levels of bycatch such as sea turtles. Pelagic longlines are a non-mobile method of targeting open-ocean fish. A fishing line up to 150 km long is floated at the surface of the water from which thousands of baited hooks are suspended for hours to a few days. While pelagic longlines cause little habitat damage, they are an unselective type of fishing and can cause high levels of bycatch. Non-target species caught by pelagic longlines can consist of juvenile individuals who have not yet reproduced, or threatened species such as albatrosses, sharks, and sea turtles. Hook and line fishing is a highly selective way of fishing. A fishing vessel pulls several fishing lines with flashing lures through the water column. This method is selective because only fast-moving fish can swim quickly enough to take the bait, and any non-target fish which is accidentally caught can be immediately returned to the ocean live. This fishing method does not make contact with the ocean floor and causes minimal amounts of habitat damage. Purse seines are nets that are deployed around a school of fish to encircle them. The netting is then pulled shut much like “purse strings” and can be hauled up onto the boat. Depending on the species targeted, purse seines can cause varying amounts of bycatch. Purse seines are often used with a fish aggregating device (FAD). An FAD consists of floating material which attracts open-ocean fish which congregate beneath the FAD. Purse seines can then encircle the schools of fish around the FAD. This method is commonly used in tuna fisheries and can catch many threatened species as bycatch such as sharks, juvenile tunas, turtles, etc. Purse seines are highly selective when used to catch school of salmon. Traps and pots are baited, immobile enclosures placed on the ocean floor and typically target crustaceans, however they can also target bottom dwelling fish such as cod or sablefish. The animals are able to enter the trap/pot through an opening of a specific size and shape, but are unable to leave. Traps and pots are selective as they are designed to catch specific species. The mesh size on the traps allow for undersized or immature individuals to escape. Additionally, any bycatch accidentally caught e.g. non-target species like octopus, undersized individuals, and females carrying eggs can be released live and uninjured. 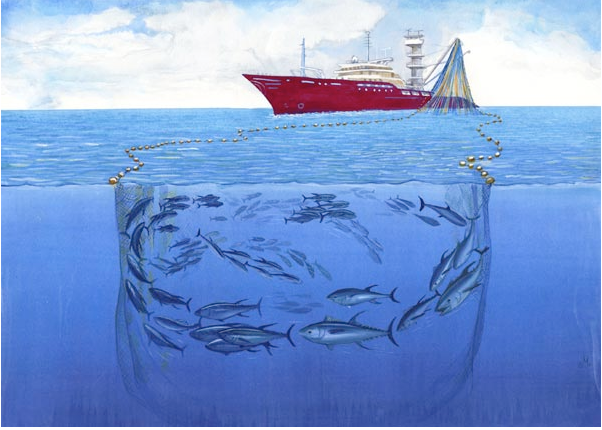 Traps and pots are generally a sustainable way of fishing, unless they are placed in areas where the main fishing line which ties them together has the potential to entangle migrating marine mammals, or if they are placed on top of sensitive habitat. Trap nets are a passive fishing technique. They are constructed out of stone walls or netting strung between wooden stakes to create a funnel that fish swim into. The fish remain entrapped and swim around inside the trap before the fishers scoop them out.